BRP Marine Group announced today the release of the largest Rotax jet propulsion engine yet - the Rotax ACE (Advanced Combustion Efficiency) 300. Now available on Scarab jet boat models and Chaparral Vortex models, the Rotax ACE 300 is the most powerful engine in the recreational small jetboat space. In addition, the new engine includes features like a maintenance-free supercharger, closed loop cooling, lateral thrust control, reduced intake noise, improved sound quality and the intelligent Neutral and Reverse (iNR) functionality. 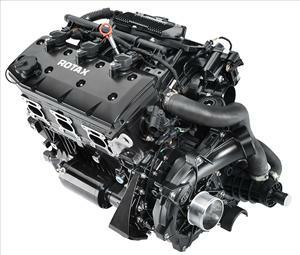 The Rotax ACE 300 is 9 percent bigger than the Rotax's next largest engine and creates 15 percent more power. Designed with a longer stroke compared to the Rotax 4-TEC 250, the Rotax ACE 300 has a displacement of 1.6 liters and increased efficiency in two key areas: friction reduction and better cooling. A new protective plasma coating on engine cylinder liners creates a metallic layer that provides a hard and durable surface to withstand piston friction forces, improves surface durability and produces better heat transfer and superior performance. A reengineered cooling system includes an additional heat exchanger and larger, more efficient engine oil cooler. A new, redesigned supercharger with a faster spinning 32-blade wheel (double the blades of the previous version) produces 30 percent more intake boost and requires no maintenance. A new larger intercooler provides a more dense air charge, aids in increased airflow and features a new air fin design for improved heat transfer. New ignition curves have been developed to efficiently match the increased air boost with the output of the larger fuel injectors, leading to the 15 percent increase in horsepower.